What comes to your mind when you think of good health? Think about every small activity or function that you do to feel or be healthy. Well, You’re right. But there’s something that comes before all of the above. What is it? That’s the first thing you do to live before even thinking of being healthy, and breathing properly is what keeps you healthy. But then, if there’s an obstruction that’s not letting you breathe properly, it’s something to worry about. One such obstructive condition is ‘tuberculosis’. Tuberculosis is an infectious disease caused by the bacteria Mycobacterium tuberculosis and usually is known to affect the lungs, and in all likelihood can affect many other organs. It is highly infectious and airborne. It spreads when a person with active tuberculosis (TB) in their lungs speaks, coughs, spits, or sneezes. About 10% of the concealed infection progresses into severe tuberculosis, and if left undetected and untreated, it can also become fatal. A recent survey has reported that tuberculosis has been the cause of 1.7 million deaths every year and is the 9th leading cause of deaths globally. This has lead to an initiative that spreads awareness about preventing and treating this deadly disease. ‘World Tuberculosis Day’. 24th March every year marks the World Tuberculosis Day, a worldwide initiative which aims to spread public awareness about tuberculosis and the efforts made to prevent and treat this disease. It dates back to 24th March 1882 when Dr. Robert Koch successfully detected the cause of tuberculosis (TB), the first step to diagnosis and treatment for tuberculosis. As the research for the treatments progressed by the years, the International Union Against Tuberculosis and Lung Disease launched World Tuberculosis Day on 24th March 1982, to coincide with the 100th anniversary of Dr. Koch’s discovery. So, did you know that tuberculosis is curable? Well, if you didn’t scroll through to understand more about the symptoms and preventive measures that’ll help you keep away from this deadly lung infection. Despite the body harbouring the bacteria, sometimes you might not have all the symptoms of the disease. It does not make you sick. Doctors distinguish this condition with the other type in which your immune system does not support you. Latent TB – The bacteria remains inside the body and does not cause any symptoms. It also does not spread to other people. Hence, it is also called inactive TB. Active TB – Active TB causes symptoms of the disease and is highly infectious. Apart from these symptoms, there’s more to know about tuberculosis. Do you know that it can also affect many other parts of your body? Tuberculosis can also affect your kidneys, skin, spine and brain. When TB affects other parts of the body, the symptoms vary based on the organs involved. For example, a severe back pain that you suffer could be a spine TB, if your kidneys are affected, you might notice blood in your urine, and you might have a skin rash that spreads all over the body if you develop skin TB, etc. So, looking at all these signs and symptoms of tuberculosis, you still have a chance to save yourself. If you notice the above symptoms, make sure you are careful when you’re among people. Wear a mask while you’re talking, coughing or sneezing. Get all the necessary investigations done. Consult your doctor and make sure you follow all the instructions well. Stop intake of alcohol, and smoking. The most important of all is to be positive and maintain an active lifestyle. World Tuberculosis Day gives you an opportunity to participate in various initiatives that spread awareness about all that the general public must know and understand about tuberculosis. 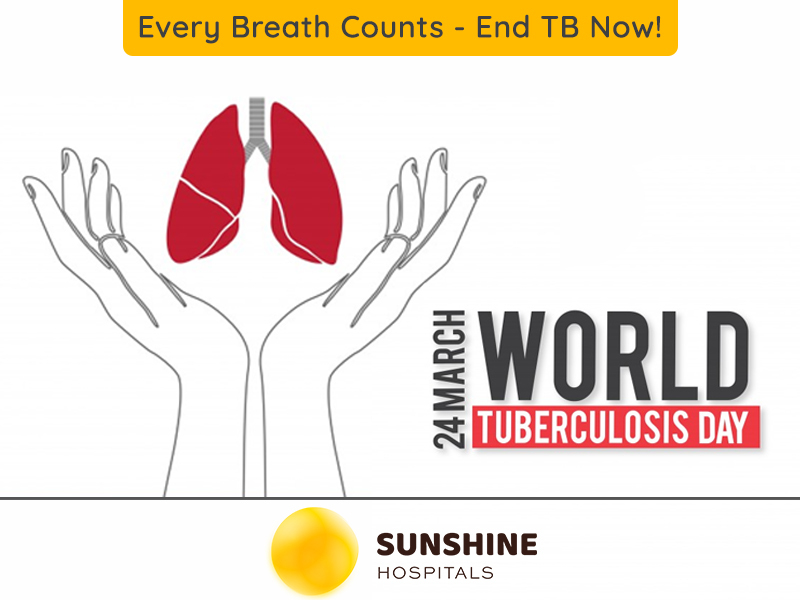 You can join us at Sunshine Hospitals, and help the world be a better place to breathe in!